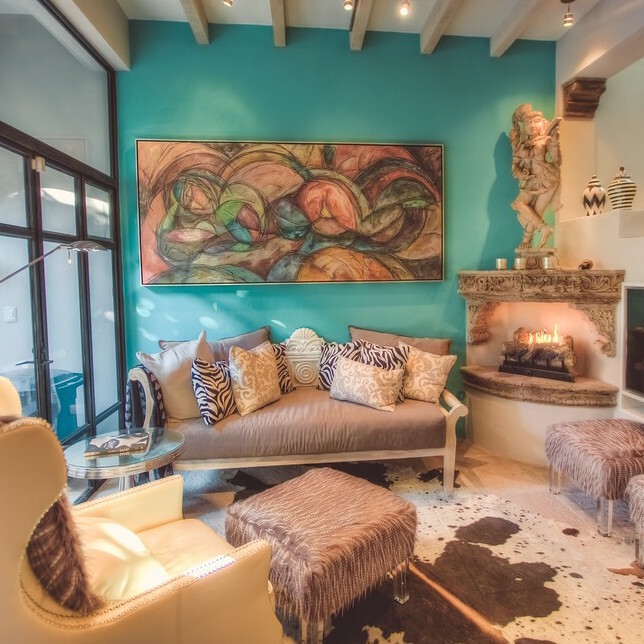 At the western edge of Centro, in a quiet residential street that includes some of San Miguel's most beautiful houses, the luxurious Casa Bethryn invites you into a superbly designed and magical retreat. 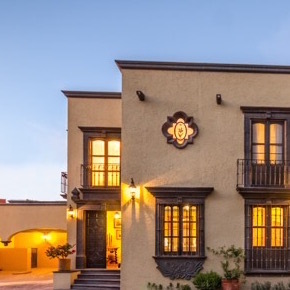 At the western edge of Centro, in a quiet residential street that includes some of San Miguel's most beautiful houses, the luxurious Casa Gabitere invites you into a superbly designed and magical retreat. This elegant, art-filled home with three good-sized bedrooms, five bathrooms and multiple lounging areas for the ultimate in indoor/outdoor living will delight you at every turn. 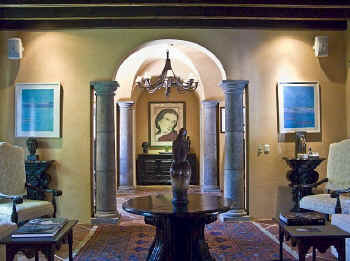 The home itself consists of three separate two-story structures, all connected by arched, covered walkways. 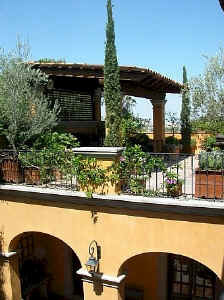 The enchantment begins almost immediately when you walk through the entry gate and down the 60-foot entry corridor through a vine-covered, mosaic-tiled passageway that opens into the first of two lush courtyards that grace the house. 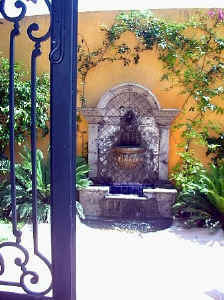 A large mesquite tree shades the front courtyard and its cascading fountain wall. 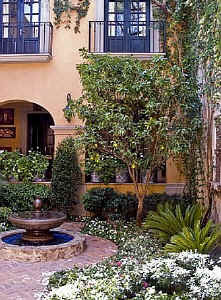 From this courtyard, you step through the front door of the house into a quiet, arched-ceiling foyer that opens to the right into the sala principal, or main living room, with its grand marble fireplace and art and sculpture collection. On your left is a powder room and in front of you are large ironwork and glass doors that lead you further into the property. 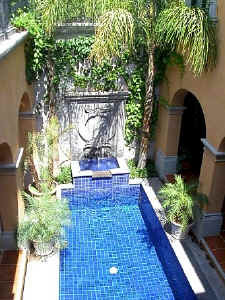 You now step down into a covered walkway that circles the blue-tiled pool and its carved cantera limestone fountain. On the far side of the pool is the sala abierta, a covered terrace with comfortable seating in front of the fireplace and the TV armoire. 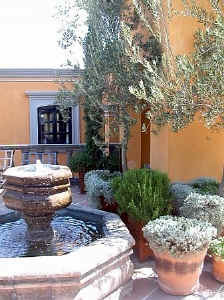 The main library, to the rear of the covered terrace, looks out onto another courtyard with citrus trees, lush plantings and another fountain. 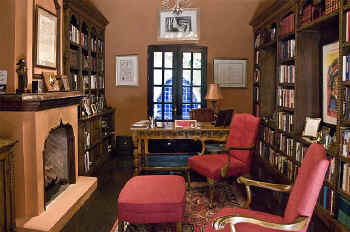 The library is filled with artwork and a cozy reading area with another fireplace, plus approximately 1,500 books lining the shelves on two walls. 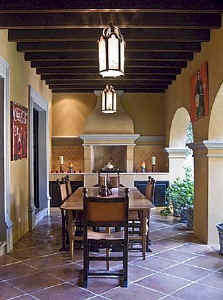 Across the rear courtyard is the large, modern kitchen next to a formal dining room with fireplace and seating for 12. 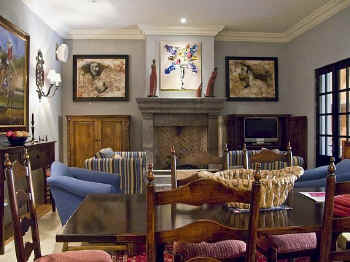 The dining room opens onto an outdoor dining terrace with its own fireplace and BBQ grill. 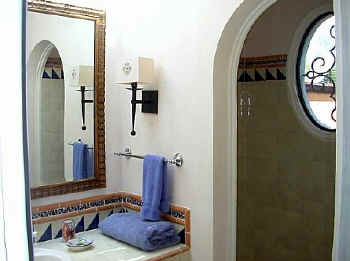 All of the tile, marble and in-laid stone details throughout the house -- especially evident in the walkway floors, bathrooms and kitchen -- were crafted by local artisans. 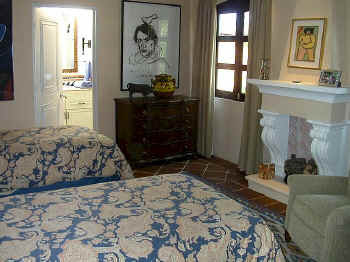 The three bedrooms are all upstairs, reached by a staircase with custom ironwork that leads you up to the roof terrace. 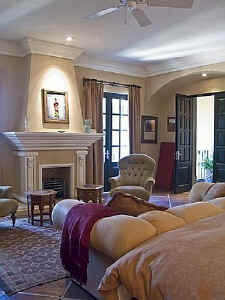 To the left of the stairs is the gracious master suite with its king bed, mosaic-tiled bathroom, walk-in closet and a comfortable sitting area (with yet another fireplace!). It has views to the west and also features two Juliette balconies with French doors overlooking the rear courtyard with its two-story, vine-covered rock wall and palm trees and flowers. 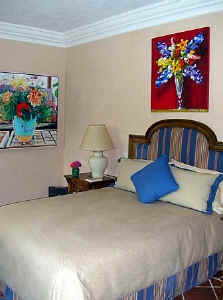 The guest wing of the house, to the right of the stairs, consists of two more bedrooms, each with its en-suite, custom-tiled bathroom and fireplace; a common sitting room with television viewing area; and a charming office with computer and Telmex special phone that allows calls within Mexico and also to the U.S. and Canada for no extra charges. 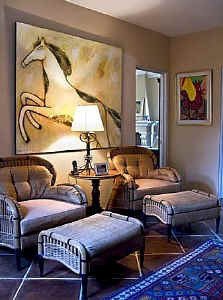 One bedroom with two twin beds (which can be joined to make a king, if so desired) overlooks the front courtyard. 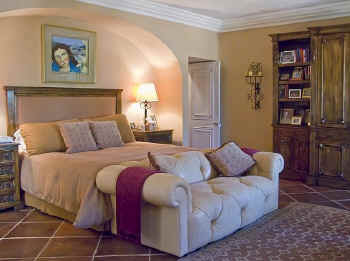 The other bedroom has a queen bed and overlooks the pool. 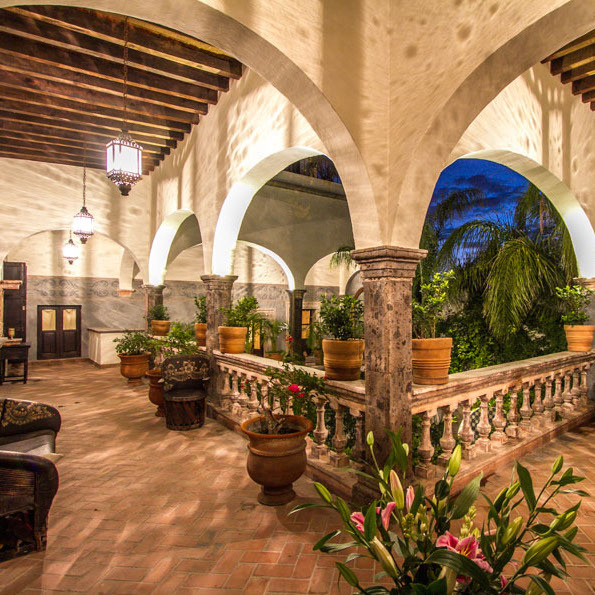 All of the bedrooms open out onto the lovely second-floor terrace, with its olive trees, flowering bougainvillea plants, fruit trees, soothing fountain and covered seating area. This is a perfect spot for viewing the western mountains and relaxing with your sunset cocktails! 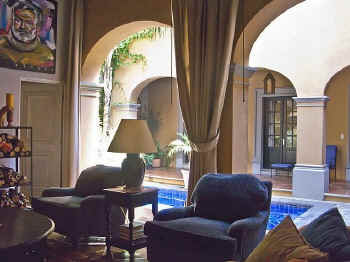 This magical home is a treasure - a perfect place for your vacation in San Miguel. 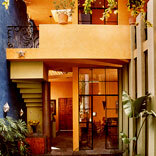 The Jardin is just 4 blocks away, and it is an easy walk to all of San Miguel's art galleries, restaurants, shops and historic places. And, the Warren Hardy language school is less than 5 min by foot away, making this an ideal location if you are planning a visit that includes Spanish language study. To make your stay complete, a rental of Casa Gabitere includes the services of Julia, the housekeeper, and Felipe, the gardener (who both come on Monday and Thursday from 9 am to 2 pm and). 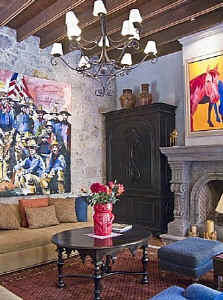 They are both devoted to making your stay in San Miguel a most enjoyable and memorable one! 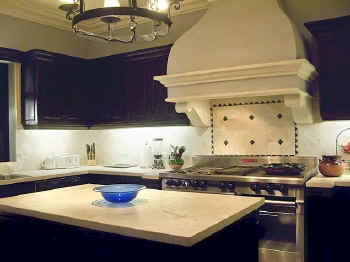 Cook service is available by special request.